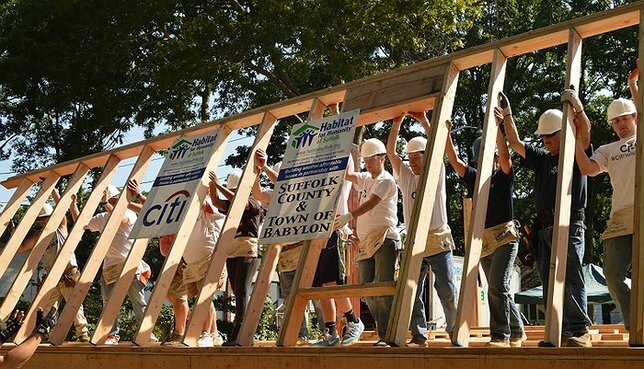 Habitat for Humanity of Suffolk and volunteers from Citi helped kickoff the construction of a Wyandanch ho9me for a single mother and her three young children. Home to be built for single mother Barbara Galloway and her three children in Wyandanch. Photo by: Photo courtesy of Habitat for Humanity of Suffolk. Wyandanch, NY - July 25, 2016 - Single mother of three young children Barbara Galloway was supported by Habitat for Humanity of Suffolk and volunteers from Citi for a wall raising ceremony and construction kickoff in Wyandanch to begin their dream of home ownership. Barbara and her two daughters, Keana, 14, and Alicia, 4; and her son Antwan, 3, currently live in a small two-bedroom apartment with very little space for their family to live and grow. Partnering with Habitat will provide a safe and affordable new home for the Galloway family. Barbara has worked at the Long Island Developmental Disability Services Office for the past seven years while also attending New York College in pursuit of a bachelor’s degree to provide her children with a better future. Subject: LongIsland.com - Your Name sent you Article details of "Habitat Suffolk Hammers and Nails the Foundation of Family's New Home"